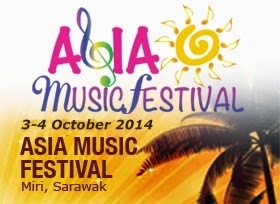 3rd and 4th October 2014 marks the second Asia Music Festival, which was being held at Eastwood Valley Golf and Country Club, Miri Sarawak. The common question you get to hear is this "How was the event?" Good question, How was the event? Here my point of view on it. I was there for the first AMF2013 and for a new project or event, it was great. Do I have high expectation for this year's event? Yeap! Some may not agree with me. Some may say that AsiaMF2014 was filled with Raggae music. True, Raggae vibes does took over the night. Well, both night to be exact. Why? Was the other acts wasn't as good as the Reggae acts? False, the other acts was equally fun to watch and enjoyable (not sure that I'm using the right word here). Yes, the Raggae acts stole the show for 2 nights in a row, first night was by Salam Musik and Masia One and the second night was by Ras Muhamad. Now, there's another issue whereby Masia One, a hip hop/rap artist, was doing Raggae instead of performing hip hop or rap. Yes, her background is hip hop and/or rap but she decided to do Raggae that night. Well, its common for artist to bring something outside of their comfort zone whenever they are performing. I wouldn't say that Raggae is outside of the comfort zone of Masia One but she did bring something different. Yes, I too was expecting that she would do some gangster/badass rapping. But hey, she did Raggae and that's too bad. Nuff' said. What really matter for me when such event is being held is to see the crowd have the time of their life. Dancing like there's no tomorrow, singing your lungs out and even scream! And that's what happen on the second night of AsiaMF2014. What about the first night? Wasn't anyone dance, sing or scream? I think its getting obvious for certain new event, for the first day, the crowd is a little bit slow. What more to say that the first night was being held on Friday (after working hours). Its unfortunately to see that the crowd was a bit slow on the first day as compared to last year's AMF2013. But the crowd kept on coming anyway. DJ Roundhead play his role well that night. He keep the crowd in front of the stage. Yeah, some are sitting down, enjoying the music and some are dancing away to the beat (that's us). The second night kicks off with a dance performance. Not being a hater but DANCE?? Yes, they are good (and the girls are hot) but DANCE??? AT A MUSIC FESTIVAL?? For me, it doesn't goes well. It might be okey for other event but not at a music festival. If they must mix a dance act try and put a DJ there to play or mix there song while they're dancing (just to show that there is an instrument being played). That would be great but it didn't happen. Well, its just my opinion but the crowd seems to love it. Ok, enough about the performance review. What really made my weekend at AsiaMF2014 memorable are the people I get to share this experience with. Members of Sarawak Bloggers (you know who you are), media friends from Brunei and KL. Given more opportunities like this, I gladly accept. Photographs? I am in the midst of editing most of the photographs and picking those that are worthy to be posted. It might take some time but I'll post 'em here and in my facebook page. Please do check them out. So, that's my review on this year's Asia Music Festival 2014.